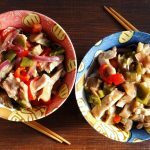 At the beginning of the year, I promised that in 2018 I would publish a recipe inspired by Japanese cuisine every month. We are in April and here is my fourth Japanese-inspired recipe. 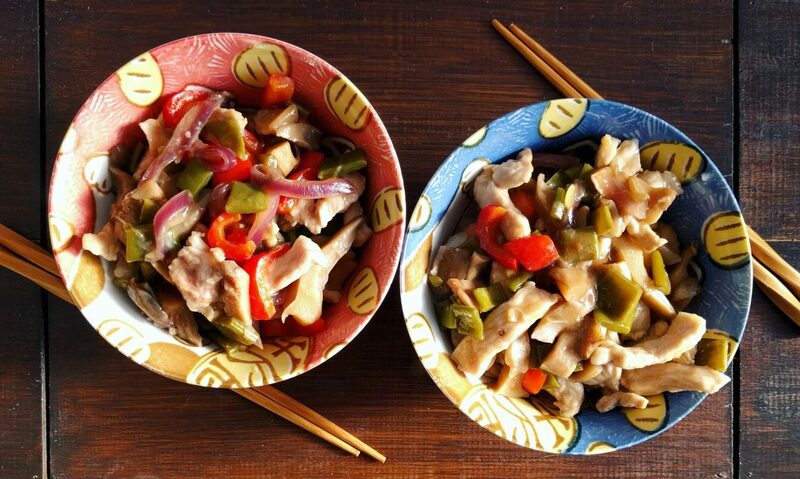 It is pork with ginger: a really simple dish to make but delicious and very healthy with no fats added. Perfect also for when there are guests as it is quick to prepare but at the same time it is pretty original. Phase 1 · Phase 2 · Phase 3 Serves: 2 Prep Time: 10 min. Cooking Time: 15 min. Cut the pork into strips and place them in a deep dish with the ginger powder, the xylitol, the tamari sauce, the vinegar and two tablespoons of water. Leave to sit for 10 minutes. While peeling the onion, cut it into thin slices and sauté it in a non-stick pan with a little vegetable broth. Wash and cut the peppers and join them to the onion. Cook for about 5 minutes. Join the pork with its sauce to the veggies and cook a few more minutes, until everything is cooked. If needed, you can add more broth. Before removing from heat, adjust salt and grate a little fresh ginger. This recipe is suitable for the Fast Metabolism Diet – DMA Phase 1, 2 & 3; With these quantities, you get 2 protein servings for <20 pounds.